MOOSE, WY — Ever wondered how Jackson Hole’s early settlers crossed the Snake River before bridges? Beginning Monday, July 20, visitors can take a ride on a replica ferry boat and experience crossing the Snake in the same fashion provided by Bill Menor through his routine ferry service of the late 1800s and early 1900s. Park ranger naturalists will offer free rides daily from 9:00–10:15 a.m. and 1:15–2:15 p.m., as well as before and after the ranger-led program, “A Walk into the Past,” that occurs each day at 2:30 p.m. Call 307.739.3399 for additional operation times. 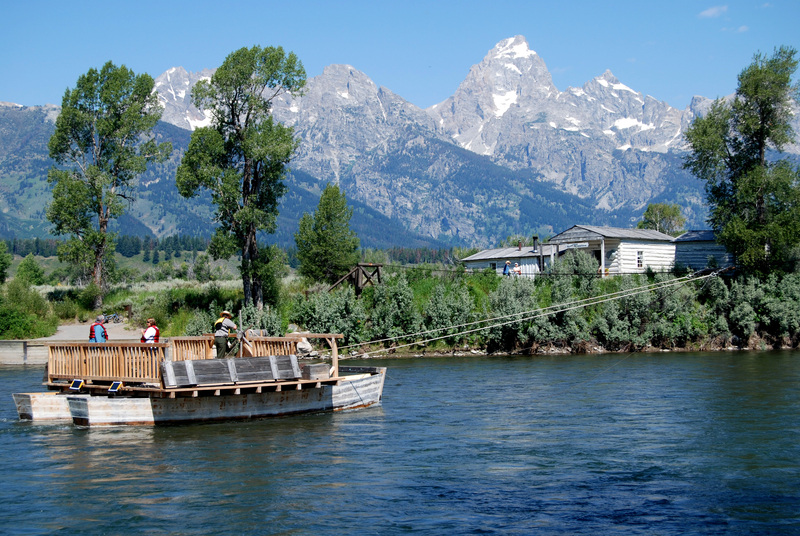 The wooden ferry boat serves as a central feature of the Menor/Noble Historic District, located just north of the Craig Thomas Discovery and Visitor Center in Grand Teton National Park. Ferry rides transport visitors across the Snake River from Menor’s general store on the west bank of the river to Dornan’s on the east bank—and back. Menor’s Ferry consists of a wooden platform deck placed upon two pontoons for flotation. The ferry is tethered to a cable system that spans the river and operates by directing the pontoons toward the opposite riverbank, allowing the power of the current to push the craft across the river channel. The system uses river power—rather than motor power—to push the ferry across the water. This type of river travel existed in ancient times and was widely used throughout the United States. Menor’s Ferry played a vital role in providing safe transport for passengers over the swift-flowing Snake River before construction of a bridge. 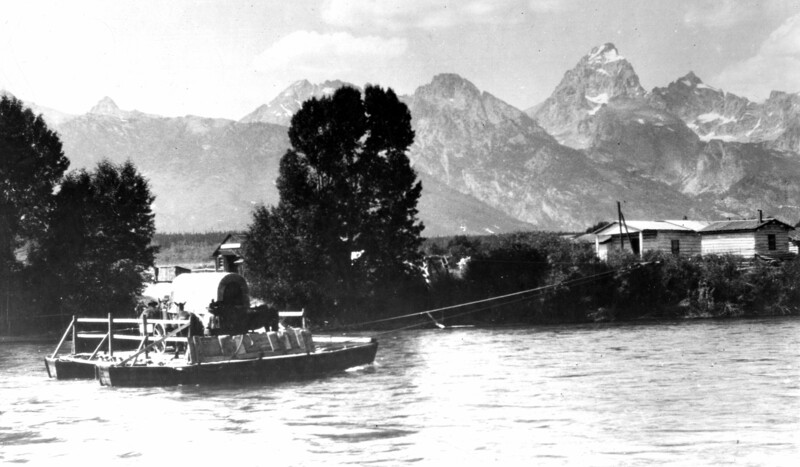 Prior to the ferry’s existence, the Snake River was essentially impassable from Wilson to Moran—except during low water periods in the fall and winter months. 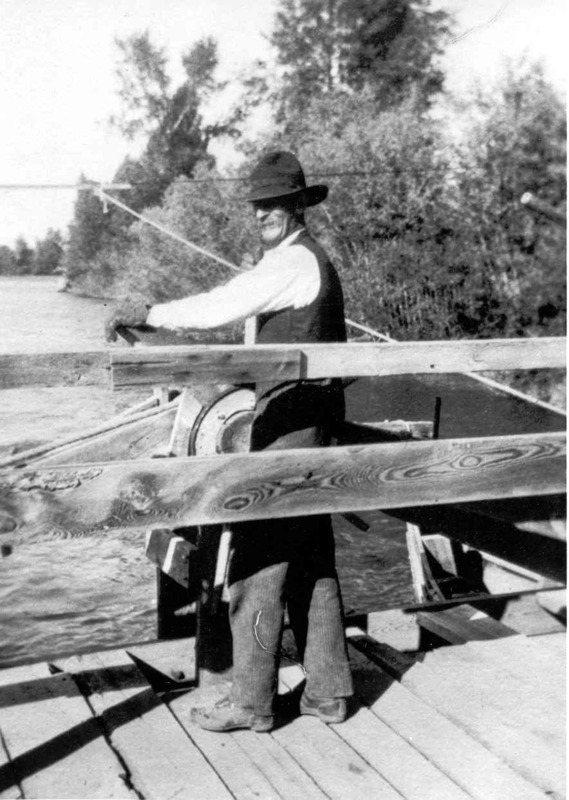 As a man of vision, Bill Menor saw the need for a more convenient access across the Snake River and consequently built and operated his ferry from 1894 until 1918 when he sold it to Maud Noble. Maud operated the ferry until 1927 when its use became obsolete after a steel truss bridge was constructed across the river, allowing for vehicles and foot traffic to cross without the assistance of a ferry service. Although transportation has changed over time, Menor’s Ferry offers a chance to step back into the past and experience a bygone time and historic mode of river passage.